Canada has secured a spot in the mixed doubles final at the inaugural World Cup of Curling. Laura Walker and Kirk Muyres, an Edmonton-based team, are 4-1 through three days and locked up first place in Pool A.
Canada has secured a spot in the mixed doubles final at the inaugural Curling World Cup. Laura Walker and Kirk Muyres, an Edmonton-based team, are 4-1 through three days and locked up first place in Pool A.
Walker and Muyres lost 8-5 to Kristin Moen Skaslien and Sander Rolvag of Norway late Thursday night, but bounced back to beat Maria Komarova and Daniil Goryachev of Russia 6-3 on Friday. Meanwhile, Rachel Homan's Ottawa rink and Kevin Koe's Calgary rink both are close to clinching spots in their respective finals. Homan (4-0) crushed Anna Sidorova of Russia 8-2 on Friday, hours after hammering American Nina Roth 9-1. 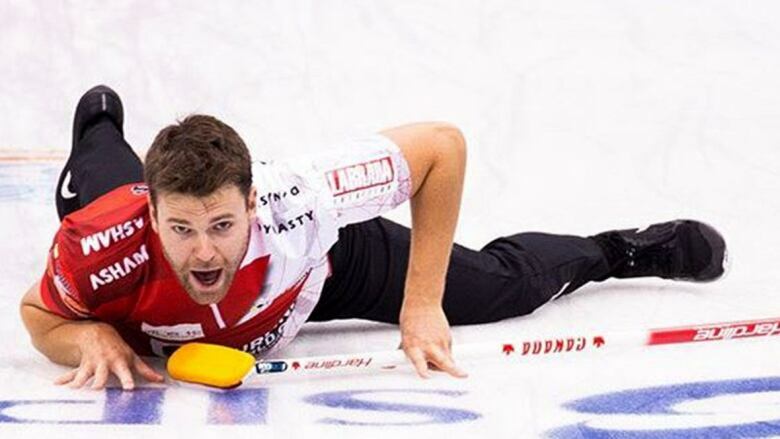 Koe (4-0) beat Peter De Cruz of Switzerland 7-4 on Friday. The top two teams in each division will play for championships on Saturday and Sunday. The World Cup offers a total of $775,000 (U.S.), or just over $1 million, for a prize pot. Winning one event is worth up to $33,000 (U.S.) to a team and that number doubles in Beijing.